[134 Pages Report] The global blockchain supply chain market size was USD 82.1 million in 2017 and is projected to reach USD 3,314.6 million by 2023, at a Compound Annual Growth Rate (CAGR) of 87.0% during the forecast period. The base year considered for this report is 2017, and the market forecast period is 2018–2023. An Increasing need for supply chain transparency and rising demand for enhanced security of supply chain transactions are major growth factors for the market. Increased automation and elimination of middlemen with blockchain in supply chain management would create opportunities for the market growth during the forecast period. 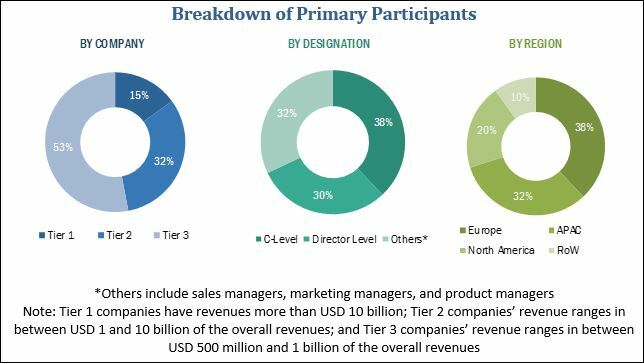 The main objective of the report is to define, describe, and forecast the global blockchain supply chain market by providers, applications, industry verticals, and regions. The report provides detailed information regarding the major factors (drivers, restraints, opportunities, and industry-specific challenges) influencing the growth of the market. The report aims to strategically analyze micromarkets with respect to individual growth trends, prospects, and contributions to the total market. The report attempts to forecast the market size with respect to 5 main regions, namely, North America, Europe, Asia Pacific (APAC), Middle East and Africa (MEA), and Latin America. The report strategically profiles key players and comprehensively analyzes their core competencies. It also tracks and analyzes competitive developments, such as partnerships, collaborations, and agreements; mergers and acquisitions; new product launches and new product developments; and Research and Development (R&D) activities in the market. The blockchain supply chain ecosystem comprises vendors, such as IBM (US), Microsoft (US), Oracle (US), SAP SE (Germany), AWS (US), Huawei (China), Bitfury (Netherlands), Auxesis Group (India), TIBCO Software (US), BTL Group (Canada), Applied Blockchain (UK), Guardtime (Estonia), Nodalblock (Spain), Peer Ledger (Canada), Blockverify (UK), TransChain (France), RecordsKeeper (Spain), Datex Corporation (US), Ownest (France), Omnichain (US), Traceparency (France), Digital Treasury Corporation (China), Chainvine (UK), VeChain (China), Algorythmix (India), and OpenXcell (US). Other stakeholders of the blockchain supply chain market include cryptocurrency vendors, research organizations, network and system integrators, blockchain service providers, distributed ledger technology solution providers, and technology providers. The global blockchain supply chain market is expected to grow from USD 145.0 million in 2018 to USD 3,314.6 million by 2023, at a Compound Annual Growth Rate (CAGR) of 87.0% during the forecast period. An increasing need for supply chain transparency and rising demand for enhanced security of supply chain transactions are major growth factors for the market. Growing need for automating supply chain activities and eliminating middlemen with blockchain in supply chain management would create opportunities for market growth during the forecast period. 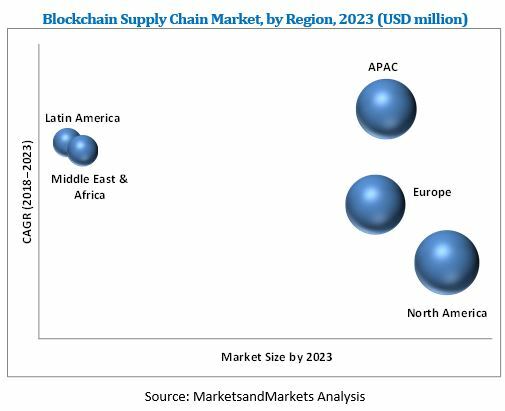 The blockchain supply chain market study aims at estimating the market size and future growth potential of the market across segments, such as provider, application, industry vertical, and region. The application segment includes payment and settlement, counterfeit detection, product traceability, smart contracts, risk and compliance management, and others* (documentation and rewards management). The product traceability application segment is expected to dominate market in terms of market size, as the blockchain technology could provide real-time information related to products at each stage of supply chain and thus, helps to eliminate possibility of counterfeiting. The blockchain supply chain market has been segmented on the basis of providers into 3 categories: application and solutions providers, middleware providers, and infrastructure and protocols providers. These providers offer infrastructure to develop in the blockchain-based platforms. Among these types, the application providers type is the fastest growing segment in the overall market. The introduction of technologically advanced blockchain solutions has witnessed a certain level of adoption in supply chain management thereby fueling the overall market growth. Blockchain supply chain applications are finding an increased adoption among industry verticals, including retail and consumer goods, healthcare and life sciences, manufacturing, oil and gas, and logistics. These major industries are adopting the blockchain technology to enhance transparency, security and product traceability across supply chain. The retail and consumer goods vertical is estimated to hold the largest market size in 2018, owing the high adoption of blockchain technology for payments and settlement, product traceability, and counterfeit detection. In terms of geographic coverage, the blockchain supply chain market has been segmented into 5 main regions, namely, North America, Asia Pacific (APAC), Europe, the Middle East and Africa (MEA), and Latin America. North America is expected to account for the largest share of the overall market in 2018. North America is considered the most advanced region in terms of technology adoption and infrastructure. The wide presence of key industry players of blockchain technology solutions in this region is the main driving factor for the market. Companies across industry verticals, such as retail and consumer goods, manufacturing, healthcare and logistics, provide significant growth opportunities for vendors in the market. In terms of growth, APAC region is expected to record the highest CAGR during the forecast period with ongoing developments in the major APAC countries, such as China, India, Singapore, and Japan. However, lack of awareness and technical understanding about blockchain technology may restrain the growth of global market. Major blockchain technology vendors include IBM (US), Microsoft (US), Oracle (US), SAP SE (Germany), AWS (US), Huawei (China), Bitfury (Netherlands), Auxesis Group (India), TIBCO Software (US), BTL Group (Canada), Applied Blockchain (UK), Guardtime (Estonia), Nodalblock (Spain), Peer Ledger (Canada), Blockverify (UK), TransChain (France), RecordsKeeper (Spain), Datex Corporation (US), Ownest (France), Omnichain (US), Traceparency (France), Digital Treasury Corporation (China), Chainvine (UK), VeChain (China), Algorythmix (India), and OpenXcell (US). These players majorly adopted partnerships and new product launches as the key growth strategies to offer feature-rich blockchain technology solutions to their customers and further penetrate regions with unmet needs.